In developing the Ever Forward capital campaign, Monsignor Sheeran made the renovation and restoration of the chapel a priority goal. Given the chapel's central role as the spiritual heart of the university, this is not surprising. In 2004, Monsignor Sheeran appointed a committee to advise on the repair and restoration of the chapel. The committee was chaired by Father Paul Holmes, later succeeded by Father Anthony Ziccardi, and included Monsignor James Cafone, Father James Spera, and Monsignor Robert Wister. Throughout the process, Monsignor Sheeran took a personal and immediate "hands-on" interest in the project. The first order of business was to "secure" the building structure and seal it from leaks. Facilities Engineering and outside consultants examined the chapel and determined that the roof, which had been replaced in the late 1980s, was in good condition. The only problem with the roof was aesthetic. The copper flashings, gutters, and downspouts had been coated with a polyurethane paint that prevented the normal "greening" of the copper. Unfortunately, this could not be reversed. It was clear that the exterior sandstone was in very poor condition. Two of the crosses had disappeared over the years, and two had seriously deteriorated. 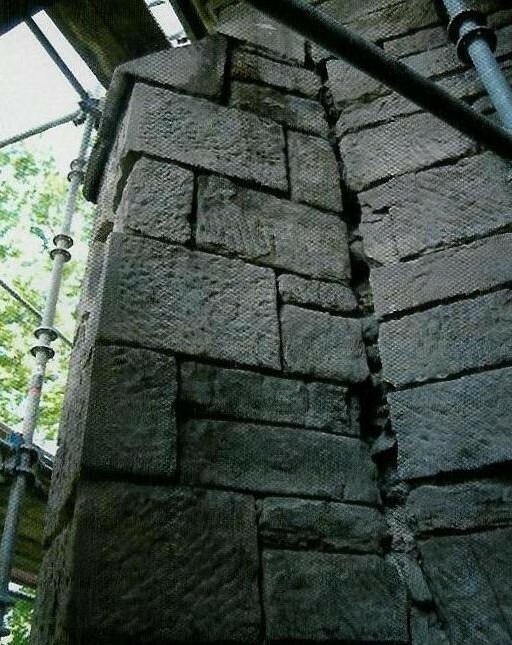 Elite Restoration of Philadelphia- was given the contract to replace stone where needed and to point the mortar. Sandstone from the neighboring Essex County quarries was unavailable; the stone either exhausted or the quarries closed and covered with urban and suburban expansion. As an example, the stone for Presidents Hall was quarried in downtown Newark, within a few hundred yards of where Sacred Heart Cathedral Basilica now stands. The stone for nearby St. John's Church in Orange came from quarries in Llewellyn Park. Neither the residents of Newark nor those of Llewellyn Park would appreciate reopening the quarries. Old World Stone, Ltd. provided samples of similar sandstone from Burlington, Ontario, Canada. Three tones of light to dark brown stone, some with a slight purple tinge were selected. In time, they would blend with the stones that would not be replaced. As work progressed, there were surprises. This was not unexpected, given the age of the building and the fact that such an extensive a renovation had never before been undertaken. However, some of the surprises were shocking, and shockingly expensive. The first surprise was not totally unanticipated but its extent proved the wisdom of undertaking the project. In 2000, a section of the plaster on the arch above the sanctuary just above the altar fell to the floor. The area was patched and life went on with the fear that there might be underlying problems. When the workmen removed the canvas mural over the arch and took away the plaster underneath, they discovered two long and deep cracks. The cracks extended from the roof to the center of the arch on each side. The arch was separating and in the future would entirely collapse unless steps to reinforce it were taken. 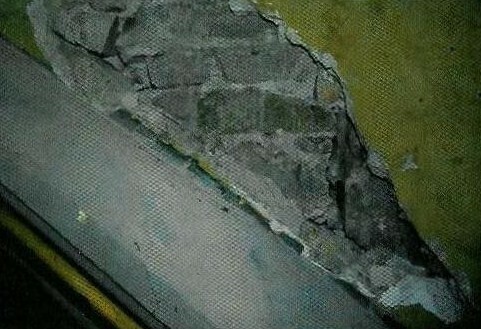 The cracks in the arch can be seen after the removal of the mural and the plaster. To reinforce the arch, steel rods were inserted from the outer walls through the arch on each side and bolted in place. They would hold the arch together. The interior bolts were plastered over and are almost impossible to detect. However, the reason for the arch's weakness soon became apparent. The external buttresses that were assumed to support the arch were, in fact, not buttresses at all, but merely decorations. They did not support the wall but even had separated from it. The false buttresses were removed and replaced with true buttresses that would insure the stability of the reinforced arch. The new buttresses were constructed of steel-reinforced concrete and then capped with sandstone, thus maintaining the original appearance while providing actual support. The buttress separating from the wall. An additional problem afflicting the arch also appeared. The wooden frame of the "Eye of God" window above the arch had almost completely deteriorated and was a source of continual water leakage and damage. The wooden frame was replaced with a stone frame to avoid this problem in the future. The new stone is lighter in color but, as it tones, it rapidly blends into the structure. When the stone work was completed, approximately 40 percent of the stones in the exterior of the chapel had been replaced. Four new crosses had been carved and set in place of the lost and deteriorated crosses. The cross over the main entrance and the cross on the peak of the chapel faÇade are the only original crosses remaining. Two weakened buttresses had been entirely replaced with hidden steel-reinforced buttresses. The chapel was secure. 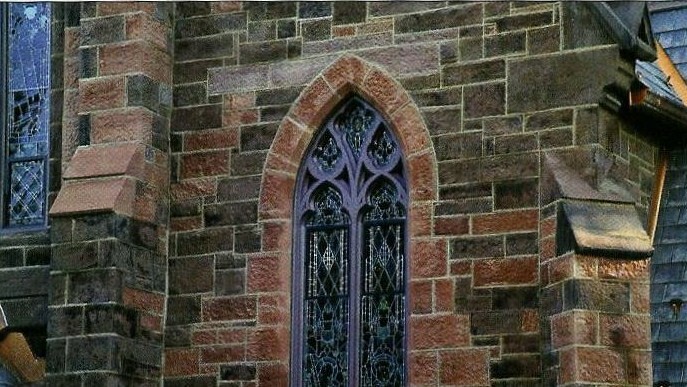 The masonry restoration received the 2007 New Jersey Golden Trowel Award for best restoration presented by the International Masonry Institute in conjunction with the BAC New Jersey Locals 2, 4, and 5, as well as the Masonry Contractors of America. The restored chapel. Note the crosses on the gables. The new stone is lighter but is already beginning to blend in.